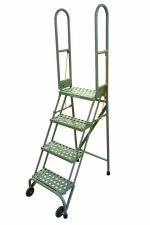 The Cotterman StocknStore Ladder is ideal for Office, Retail and Industrial use. Not only does it roll but it quickly folds by pulling two grab wires for easy storage. The 30" high handrails offer added safety when climbing. Available in 3 different tread types: Perforated (lighter indoor industrial use), Solid Tread with Rubber Matting (ideal for office and retails environments) and Grip Strut (provides maximum slip resistance). All ladders have a 350 lb. weight capacity. 2 Step StocknStore Ladder from Cotterman. Features all welded Steel Construction. 350 lb. weight capacity. Available with Perforated Steps, Grip Strut Steps or Solid Steps with Rubber Tread. 3 Step StocknStore Ladder from Cotterman. Features all welded Aluminum Construction. 350 lb. weight capacity. Available with Perforated Steps, Grip Strut Steps or Solid Steps with Rubber Tread.